Due to recent changes WordPress have made on WordPress.com, the Statistics button in our menu bar is currently redirecting to the WordPress homepage – which for most people will appear as the ‘Reader’ page. You can still view your stats by going to your web dashboard. To access your web dashboard tap on the blue ‘Manage Blogs’ button and then the blue button to the right of your blog. From ‘Blog Options’ select ‘Go To Web Dashboard’. You can see a snapshot of your stats from your Web Dashboard homepage, or tap on ‘Site Stats’ in the left menu to see your full Stats page. When with the update be ready? 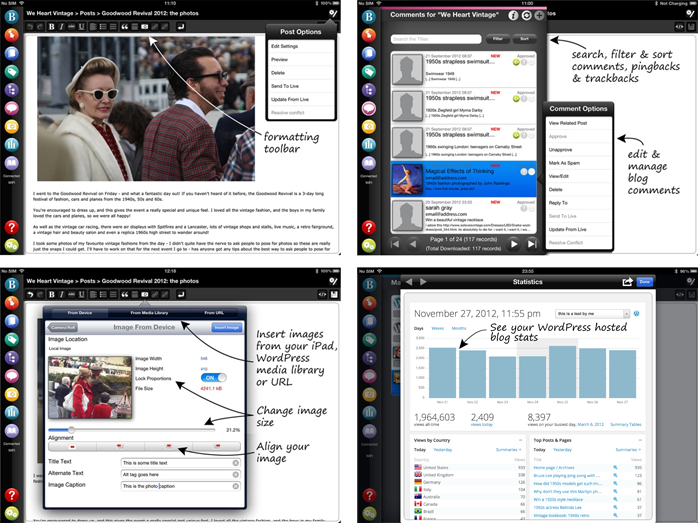 We’re currently working on a major new update to BlogPad Pro which includes lots of new and exciting features. Because we’re in the middle of making such big improvements we can’t just do a quick release to solve this problem, but rest assured that we are working like crazy to get it available as soon as possible! You will be notified via the app as soon as the update is ready to download. As a team of avid WordPress bloggers, we felt there was a gap in the market for a professional (and yet easy to use) blogging app for the iPad. Our aim was to create a stable and intuitive app which gives you everything you need to run multiple large (or small!) WordPress blogs on your iPad. We also wanted to make it easy to blog when you’re offline – like on a plane journey – or when you can’t get connected. So we’ve made a simple 1-click syncing system for updating your blog when you get back online. We wanted our app to look great, be simple to use and packed with great features so you never need to leave your iPad. There’s nothing more annoying than having to fire up your laptop because an app just doesn’t offer you everything you need! WYSIWYG editing: style your posts with a touch of a button. No coding required! Write and edit raw html – although with our great WYSIWYG editor you may never want to! Please visit https://blogpadpro.com/press for a full list of features including videos and screenshots of the app. BlogPad Pro is now available for £2.99 in the UK and is priced accordingly in other regions. The app is available worldwide in the Apple AppStore. BlogPad Pro app for iPad was developed by Macroweb Ltd , a web and software development company incorporated in 2004.